The purpose of this writing is to explore the concepts behind the technology of Personal area Networks (PAN) and discuss their various types of deployments and uses in today’s society. PANs are not a new concept and actually date back to early 1996 when T.G. Zimmerman from the IBM Almaden Research Center published a paper demonstrating detailed concepts of an early network prototype. At that time, it was well known that privacy was a big problem yet the notion of autonomous yet interconnected devices would transform the idea of ubiquitous computing into that of ubiquitous I/O. The IEEE formed the 802.15 Working Group in March of 1999 to develop short distance wireless standards for Personal Area Networks. Since then various organizations came into being to explore the various aspects of the Wireless PAN (WPAN). 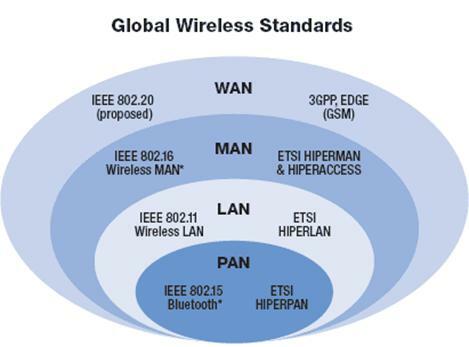 The IEEE 802.15 Working Group provided the following distinctions between PANs among the many other types of networks. Personal Area Networks (PAN) can be defined as, “The interconnection of devices supporting segments up to at least 10 meters in length”. In today’s society we are very familiar with the concepts of LANs, both wired and wireless, which provide access to the vastly global reaching Internet that we all use on a daily basis. The need for secure connections and proper authentication, authorization, and access, is ever present in today’s computing environment. PANs are widely prevalent in today’s society used mostly for home automation applications such as lighting, HVAC, home surveillance, alarming systems, etc. The technology running underneath the hood is not your typical IP based network communications. PANs operate under four basic types of technologies: electric field, magnetic field, radio frequency (RF), and optical infrared. Various implementations of PAN technology has been developed among various manufacturers include ZigBee, Z-Wave, INSTEON, and X10. PANs can be powered from USB, FireWire, power outlets. INSTEON, for example, is a low cost dual-band PAN networking technology augmented for home management and process control. INSTEON allows low costs devices to be interconnected using existing powerline infrastructure, radio frequencies (RF), or a combination of the two, which is the main differentiator from ZigBee and Z-Wave which are both radio only communication protocols. INSTEON operates in dual-band (RF and Powerline) modes in unsupervised peer-to-peer or mesh topologies. All devices operate as two way repeaters, contain error detection, message acknowledge or “retry if not acknowledged”, and are synchronized to the powerline. Data transfer rates are 13,165 bits/sec instantaneous or 2,880 bits/sec sustained. The fascinating thing here is that the INSTEON protocol supports over 16 million unique IDs and 65,536 different device types with just as many device commands. The INSTEON protocol maintains network security at two levels, “linking control” and “encryption with extended messages”. Linking control requires a user to have physical possession of an existing linked PAN device in order to create links to new devices. Encryption with extended messages is used for applications such as door locks and security systems, which include possible encryption methods such as rolling-code (as implemented in garage door openers), managed-key, and public-key. PANs utilize powerline and/or RF technologies which are inherently secure because devices do not identify themselves with other devices unless a user physically presses a linking button located on the device. PAN protocols are not transmittable across the internet which essentially provides a security barrier in that sense but can be linked to the Internet through the control of an intermediary IP based managed controller. One such device developed by third party vendors is the ISY994i Home Automation Controller with Dual-Band PLM by Universal Devices. These IP based management controllers are the gateways that allow attackers remote access into Personal Area Networks. Its critical for users to assure they apply the same principles of network security to their PANs once they interconnect them to any IP based network via a managed controller. A large number of vulnerabilities are introduced into the PAN after an IP based managed controller is installed including: remote disarming of security systems, opening of door locks including garages, and turning off exterior/interior lighting. Although the idea of a Personal Area Networks is not new, this networking technology is now being met with wider acceptance mainly due to the proliferation of home automation. Networking devices within the home are poised to become a major industry in the twenty-first century. Implementing PANs is made even easier by using infrastructure that already exists in many homes and this technology isn’t prone to many of the security concerns associated with IP based networking.